It’s officially a New Moon in Cancer on Monday July 4, 2016 at 7:01 am EDT. This is the beginning of a new phase of summer. The Sun entered Cancer on June 20 marking the Summer Solstice. Now we have the Sun, Moon, Mercury and Venus all in the sign of Cancer this week. Soon after the Moon meets in precision with the Sun for the New Moon in Cancer, the Moon reaches out to Neptune, Pluto and Jupiter. This symbolizes new growth in spirituality, changes in our relationship to career and bosses, and the ability to grow in our skills and service to others. It can be a spiritual renewal for many of us, especially relating to our family and origins. It’s a great time for a trip down memory lane looking through old photographs of those you have cared about. A sense of nostalgia is good for the soul. Music that you overhear could give you a flood of memories back to good old times. Cancer is a water sign, and like each of the water signs (Cancer, Scorpio and Pisces) it symbolizes more feminine, receptive qualities in our lives. Divine feminine, loving goddess and mother archetypes and the beauty and warmth of womanliness is emphasized now. Psychic intuition, compassion and spiritual healing energy is in focus. It’s a great time to rest, relax and pamper yourself more and to put priority on taking care of your home, family, pets and the well being of your body. Delicious, nourishing, comfort foods, wading in the water at a beach or pool, getting a massage, and taking an aromatic bath, are all recommended now. This is also a great time to develop more compassionate and caring qualities in your relationships. Romantic relationships where the bonds are based more of the heart and less of the ego, should find this a very warm time to blossom. The Moon also reaches across the sky to Pluto retrograde in Capricorn on Monday. Pluto signifies getting rid of things you don’t want in your life to create the changes you need. In Capricorn this speaks more specifically to the changes needed in our careers. It can also signify finding your balance in prioritizing your personal life first and foremost instead of your career life. This is especially true if you have someone expressing excessive Saturn, Capricorn or Pluto energy. If they are on the extreme end, it could even manifest some of the qualities of a self centered, self glorifying, fame and money hungry, egotistical boss or superior that you just want to get away from for your own well being, and that would be a red flag. Rather than exhausting yourself working to benefit someone else most, it's time for you to take care of yourself and people close to home as a priority. Changes in career are set to develop over the next couple of weeks as we evolve toward the coming Full Moon. The deeper meaning in the origins of beautiful architectural design could have your curiosity. Politics and traditional religion would do well to have a greater infusion of a feminine point of view as well. The Patriarchal and egocentric male dominated stronghold shows signs of weakness that inspires a more well rounded, balanced approach. Pluto retrograde demands a restructuring and purification of power structures so we can rise to a more elevated place in society. As mentioned, it’s a great time to focus on taking care of your body. Time in a pool of water to allow the structure of your body to feel weightless can be especially helpful in releasing tension on your bones and joints. Calcium supplements may also be helpful in keeping bones strong and slowing skeletal deterioration. A good place to put your energy this week is towards what you want to grow. Jupiter in Virgo continues to emphasize the importance of creating a happy, prosperous, abundant lifestyle. By focusing on developing your skills, and putting in the time to create healthier habits, you tap into the power of growing towards your aspirations. When you care about what you do, it shows. Home based businesses can benefit from new beginnings this week. Spa and hospitality service businesses would do well to focus on new ways to create comfort for clients this week. Mercury and Neptune are in harmony on Tuesday, July 5, 2016. This further emphasizes the connection of mind, body and spirit. Massage has been said to be “meditation for dummies.” Through the relaxation process the mind has a chance to release tension and drift to a more comfortable place inside. As worries and stress melt away, the mind drifts into a more mystical, visual, imaginary place that enhances your experience of well being and connection to a more spiritualized experience. This is a great time to put on some music, dance and drift away into your fantasies. Life can feel more poetic and this week is great for creative artists to explore anything that flows, like painting, particularly watercolors. Venus and Mars are in harmony on Wednesday, July 6, 2016. This is great for relationships of course, especially emotional, caring bonds. Attractions to the motherly, gentler, feminine quality is as enticing as the direct, masculine, primal qualities. There is a natural alchemy between the sexes now. Rock hard athleticism and curvy voluptuousness are equally appreciated. Although this week has a highly feminine vibe, it's also important to appreciate the male archetype in its valor with Mars direct in Scorpio now. Music with a romantic quality will move us deeply this week. Pay attention to what you feel and what those you love feel. Enjoy your life. Fast moving Mercury meets up with the Sun on Wednesday as well. Mercury and the Sun then connect with Pluto on Thursday, June 7, 2016. 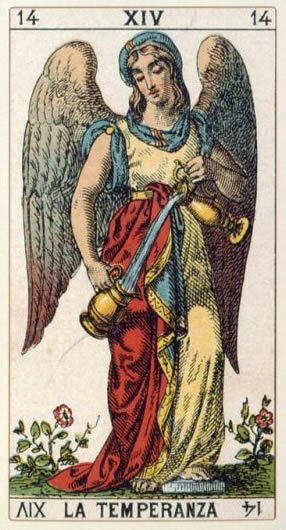 As Mercury flies in on winged feet over the waters of Cancer, the Sun shines with delight. They both connect with Pluto. This puts further emphasis on the balance between home and career matters as mentioned above. If you have a boss that is simply getting to be too much, take a break and get your mind focused more on the things that matter in your personal life. There’s nothing wrong with taking a mental health day when the pressure gets to unhealthy levels. This can be great for the busy-bodies that can’t get enough gossip. If there’s something going on that perks up your ears, you’re likely going to want to curl up on the couch and gab about it for hours to shine light on the situation. When it comes to disagreements, it’s more likely that the mother or woman will have more people on her side this week. Mercury and Jupiter are in harmony on Friday, July 8, 2016. This is great for discussing taking care of business at home. Whether it’s the everyday mundane tasks of keeping the house in order, or working on a home business plan, this is a great day for productivity with an eye on growth. Great ideas on home improvements are optimized on this day. As Venus continues to move through Cancer she has a tough connection with Uranus in Aries on Thursday, July 7, 2016. But because she also connects sweetly with Mars in Scorpio, there is a more positive side to this. Though you may question your worthiness, perhaps your body image could take a bit of a blow, it’s likely to just remind you to take better care of yourself overall. Pay more attention to the people that remind you that you are simply beautiful. Surprises are possible, so if you are in an intimate relationship, but don’t want to get pregnant, you know what to do to minimize results. Exercise is recommended for a better overall sense of confidence and well being. 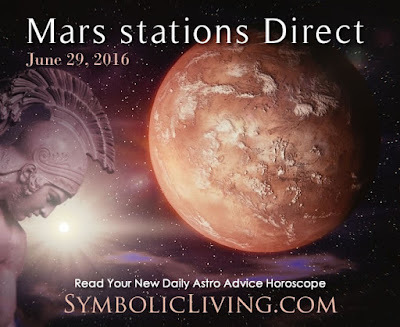 Finally, Mercury and Mars are in harmony on Sunday, July 10, 2016. This is great for a positive direction in thoughts and attitudes. Mars now direct in Scorpio puts a focus on moving forward in life with momentum, willpower and drive, all backed by a healthy psychology. Words that are caring go the furthest in making an impact. Brisk swimming is recommended for exercise. Now that kids are out of school for the summer, this would be a great time to visit a water park or the beach. Family, pets and those closest to you should be a priority this week. Stay hydrated. Water is essential. Enjoy the sunshine and make some good memories. There is a sentimental quality to this week overall, leading to a deepening appreciation of your history, family members and people that have been an important part of your life journey. I’ll talk much more about all this in each of the NEW Daily Horoscopes as the week continues. I also spoke about this New Moon in Cancer and much more in the Monthly Horoscope sent to subscribers of the newsletter on July 1. Aries: Take care of yourself this week. Although you may have your eyes set on new goals and your career is going through changes, you still need to take care of your body, mind and spirit. Putting more attention towards your money situation brings rewards and a greater sense of security. A close eye on how your money works for you can make it grow, but first you need to be aware of the bottom line. Physical activity is best for your state of mind now. The comfort of home, or a hot tub, is best for romance this week. Taurus: It’s a great week to be creative and artistic. Beautiful words are your best gateway to creating bonds that matter. Exercise can bring you more vitality and inspire romantic encounters. Chatting by the pool or the lake has a way of inspiring a poetic view of life. Connecting with family and siblings gives you a better perspective on your life. Those around you want you to show them you care, so reach out and give someone you love a hug. Being close will likely change the way you see the world and thus your goals will change. You’re entering a new phase of heartfelt interactions that can bless your life. Gemini: This is a great week to care more about your money situation. You may be tempted by beautiful things, but if you’re smart and budget right you can get what you love and still feel like you’re in control of your finances. Discussions on ways to get more organized and use your energy in the most efficient, emotional intelligent ways will kick off a new phase of growth for you. If you are interested in getting a larger place, this is the time to take a look at prices so you can know what to expect and make better plans. It’s not the best time to take out a big loan, unless you do a lot of investigating on the overall picture. Your dreams could lead to new goals. Be careful you don’t overindulge on comfort foods or you’ll likely have an expanding waistline soon. Cancer: Happy New Moon! It’s your birthday month and you get the benefit of a New Moon to help spur you forward towards new vistas. A better appreciation of yourself has a lot to do with how you talk about yourself. Instead of nitpicking and worrying about little things, focus on walking the talk to bigger things in your life. It’s an excellent week to be creative. The practice of working on some artistic task will give you a better psychological understanding of yourself, and through it You become the work of art your actions define. You are changing and your relationships are changing. Your philosophy on life is going to grow a lot this week and this year. Your New Moon is only the beginning. Leo: What a brilliant week this can be. Imagination continues to be lit up, and now it’s going to just keep growing. The more you dream and daydream the better. Write down your elusive ideas then work on solidifying them by deconstructing and reassembling the ideas into new ideas. The process of refinement on your craft will bring you a sense of accomplishment to be proud of. Getting lots of sleep is good for your body now. Meditating near bodies of water can bring you great financial ideas for growing your bottom line. Home can be a place of power for you now. A water fountain or waterfall brings good energy to your environment. Sparkles of sunlight or moonlight on the water sparks your imagination well. Virgo: New people in your social life are recommended. It’s not so much about having more people, but rather having people around you that you have a heartfelt connection with that matters more. People you can easily talk to and share with honestly and openly are best to give you a grander sense of confidence. When you’re doing anything creative, less can be more. If you’ve been working on anything and it’s getting to be too much consider ways to be more minimal and cut back on the structure and requirements. Using your time to be of service in healthy, healing ways, heads you in the right direction. Libra: Family is important, but so is your work family. You are meant to grow towards your ambitions and build a career that feels renewed now. Weighing your time intelligently, you can find balance between your work and home life. Figure out what is using up to much of your time or what is wasting energy and you can then prioritize the next steps. Your career benefits from your imaginative side. Valuing and appreciating the goals you set will put you on another level. Words, particularly kind, caring, heartfelt, and beautiful words can help your career grow. Focus on the things you want, and less on the things that are best left alone. Scorpio: What are you working towards? You should find yourself picking up steam this week as you head forward. You may need to keep a tight lip about some things that aren't set in stone yet. Focus on learning and understanding the world around you more. You are at the beginning of a renewal of your life that will expand your horizons. With so much power inside, you have a reputation of not always being the kindest sign in the zodiac, but this week it is a more caring and compassionate stance that actually empowers you. You are also likely to be attracted to a wider variety of people than usual, as you see their beauty more easily. It is when you reach out to the heart of others that passion for life takes on new meaning. Sagittarius: Are you tempted to borrow money to make life feel better now? If you are envisioning a dream home, or a dream reno you’ll need to be realistic about your financial situation. Not having all the money you want can be one of your biggest motivations to upping your career to the next level. You’ve got smarts on your side. When you apply yourself and get organized you can do just about anything. It’s a good time to read more and take in all the beautiful ideas around you. Soak up life experiences like a sponge for inspiration. It’s a great time to take care of your body. A beauty treatment is recommended to help you tap into a new sense of emotional intelligence. Capricorn: This is a great time to let people know how much you care. We all have faults, and we have a lot to work through in this life to understand who we are. Other people can show you new ways of caring about yourself and others. A new phase of relationships is opening up to you. Think beyond your usual confines and become more broad minded. It’s time that you got rid of some of the long term hangups that have been holding you back. A conversation on spirituality, higher ideals, or creativity can remind you of how much you care about the spectrum of life. If you’re feeling more introverted than usual, enjoy the time daydreaming. Aquarius: This week marks the beginning of a new phase of work. Whether it be working at your job or working on your habits and lifestyle, it’s time to bring more emotional intelligence to how you are spending your days. If you love delicious foods, you may find it's too easy to go overboard trying to find ways to feel more comfortable in your body this week. It’s possible that your waistline could only grow if you’re indulging. Health requires work. If you have an unrealistic view on money, you could wake up this week in how work and money go hand in hand. Your career and goals could demand more of your energy to pick up earlier times you may have been slacking. You may need to let go of some of your imaginative ideas in favor of creating more structure. Pisces: A new phase of creativity could kick off for you. Anything that is created with care, love and intelligence is sure to end up being beautiful and satisfying. Whether it’s a delicious meal you create, a painting, or you’re singing a lullaby to a young one, when it’s coming from a place that feels good inside, you’ll feel lit up. Do be sure to not go crazy on supplies though, or you may get a surprising bill. You may need to have your social life take a bit of a back seat so you can focus on creative endeavors, and that’s ok. There’s a time and place for everything. Poolside chit chat and watching activity at the beach can be a catalyst to new creative ideas.